In 1905, the Bobbs-Merrill Publishing house released Indianapolis author Meredith Nicholson's (1866 - 1947) novel, The House of a Thousand Candles. The book, partly inspired by Nicholson's visit to a similar house on the East Shore of Lake Maxinkuckee, became one of the best-selling novels of its day and inspired a play and two motion pictures (though the latter one, from 1936, strayed so far from the plot of the novel as to become almost a different story entirely). The setting of the novel in the Culver area (Nicholson changed Culver Academy to an Episcopal girls' school called St. Agatha's) has become part of local legend, and the house, today owned by Craighton Hippenhammer and having an illustrious history on its own outside of the book, still stands. 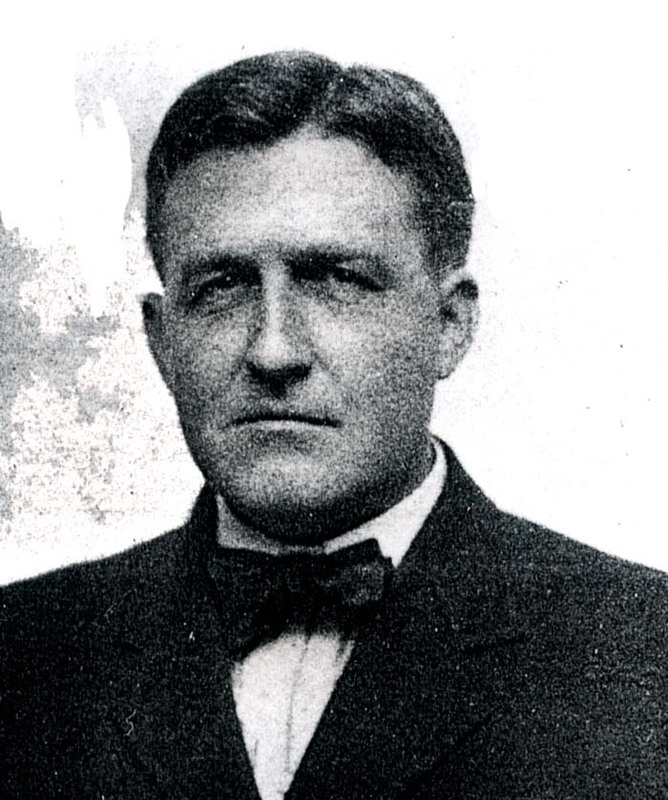 Nicholson himself had quite a legacy as Hoosier novelist, author, and activist. His former home in Indianapolis, in fact, houses the Indiana Humanities Council. More information about Nicholson here. The Humanities Council website here. The Meredith Nicholson Collection of the Indiana Center for History. The entire book is available for reading or download online! Click here to read the entire book in htm format. Click here to choose a different format or download the book. Info on ordering your own copy of the book here. 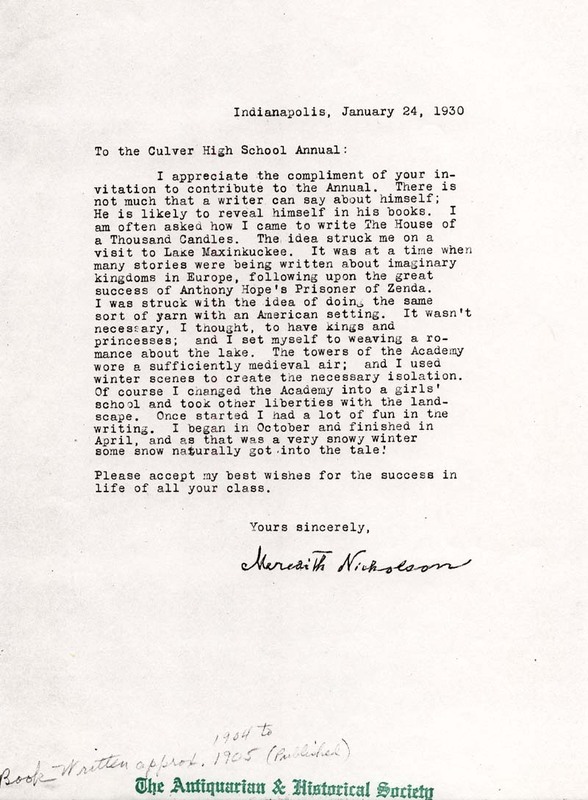 Below: In 1930, in light of the local connection to the book, the Culver High School Annual wrote to ask Nicholson for some comments for the annual. Below is his letter of response (click to enlarge). 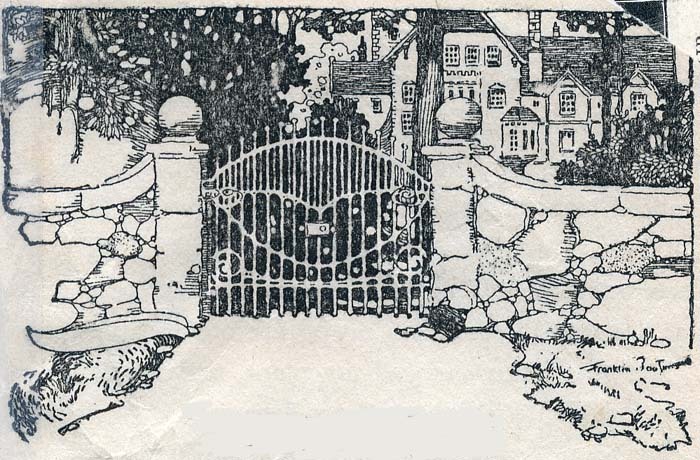 Below: The first two illustrations, at the opening and closing of the novel, perhaps best capture the look of the actual house on Lake Maxinkuckee. Click here to see all of the illustrations from the book. 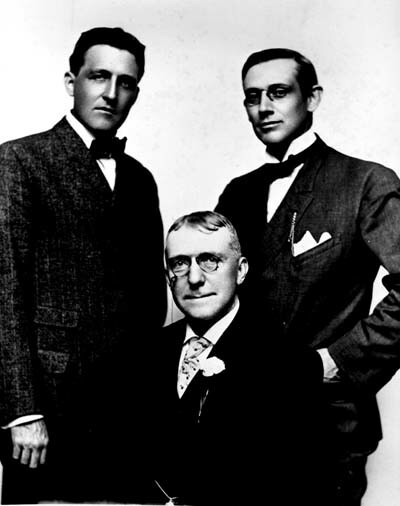 Above: (left) Meredith Nicholson with Hoosier authors Hewlitt Howland and James Whitcomb Riley; (right) Nicholson with Riley. Above: A modern edition of the book. In 1915, the Selig Polyscope Company produced a (silent) motion picture version of the film. It is unclear to us at this time whether any prints exist of the film. A 1936 version was also released, but completely changed from the original story and probably of little interest to local readers (and reportedly a terrible movie besides!). In 1915, Grosset & Dunlap of New York reprinted the book in a "movie" edition complete with photos from the film. Click here to view all the photos from the book. From the original preface to the book: Note: In adapting THE HOUSE OF A THOUSAND CANDLES for production in motion pictures, the Selig Polyscope Company interpolated several interesting incidents, including a cabaret scene and a masquerade ball. Illustrations used in this volume of these scenes therefore have no reference to the author's text and are printed only in this photo-play edition. Below is Meredith Nicholson's Preface to the Motion-Picture Edition, which mentions Lake Maxinkuckee as inspiration for the novel. Stevenson is said to have remarked on an occasion that he wished some one would write a book as good as Treasure Island; that he should like to read it! As it would be unbecoming for me to pretend to greater modesty than he possessed I shall not scruple to say that if a tale of about the same general character as this were to be offered me at a reasonable figure I should not hesitate to buy it. Readers of novels are not interested in the nature or source of the authors' inspiration. The story itself is the main thin, and it makes no difference whether the writer "thought it up" while shaving, or in church or in jail. Still, as this story is now growing old, some of its later readers may be amused to know how near it came to being something quite different. The first germ of which I was conscious filled me with a longing to write an adventure tale with an old-world atmosphere in a new-world setting. Notre Dame, Indiana, seemed at first a likely scene, though I am unable to say why, unless it were a feeling that the Bell of Notre Dame occurred to me as a good title. About that time I happened to visit some friends at Lake Maxinkuckee, also in Indiana. On a bright September morning, while looking off across the lake at the tower of a boy's school, it flashed upon me that here was an ideal scene for just the type of story I felt impelled to write. In order to surround the lonely house on the lake with the necessary air of isolation and mystery I fixed winter as the appropriate season. The winter of that year proved to be a snowy one, and I used to go out at night and walk the streets near my home in Indianapolis in the hope of catching the winter spirit. One of my neighbors was remodeling his residence, and the scaffolding lifted against the skyline suggested the unfinished house in and about which the incidents occur. If writing is not a pleasure the results are pretty likely to be disappointing; that, at least, has been my experience; and I frankly confess that I had a great deal of fun writing this book. It was never carefully planned, though of course I had from the first a general idea of how the adventure was to end; but once started it ran along at its own pace. I wrote what came into my head from day to day, going to my desk for two or three hours in the morning and then spending the afternoon in revision. Some of the chapters were rewritten half a dozen times. One chapter that I thought rather fine, wouldn't fit anywhere and I was obliged to drop it into the fire. I regret to say that no one ever complained of its absence from the book! As the work progressed I began to feel that it was an adventure of my own I was describing; and even now, in glancing over the pages, I have a feeling that it is a personal narrative -- something that I really experienced. The publisher had, I think, as much fun in finding a market for the book as I had in writing it. No one can have failed to see candles blazing everywhere announcing the book's publication. The title was so impressed upon the public's consciousness that it is still paraphrased frequently to advertise other commodities. I have on my shelf German, French, Spanish, Italian, Swedish, and Norwegian translations. The novel was dramatized and that gifted player, Mr. E.M. Holland, presented the play as far from its originating points as Honolulu; and now the moving picture film is telling the story over again in a new medium. The critics have praised other books of mine far more heartily than they have praised this one; but in no other case have I found favor with so many readers. The public and the critics view the merits of novels from quite different angles, it seems. But I am glad of the opportunity afforded by this preface to say to the considerable number of persons who have honored me by perusing these pages that their generosity and kindness in this particular have given me what is far from being the least happy experience of my life. 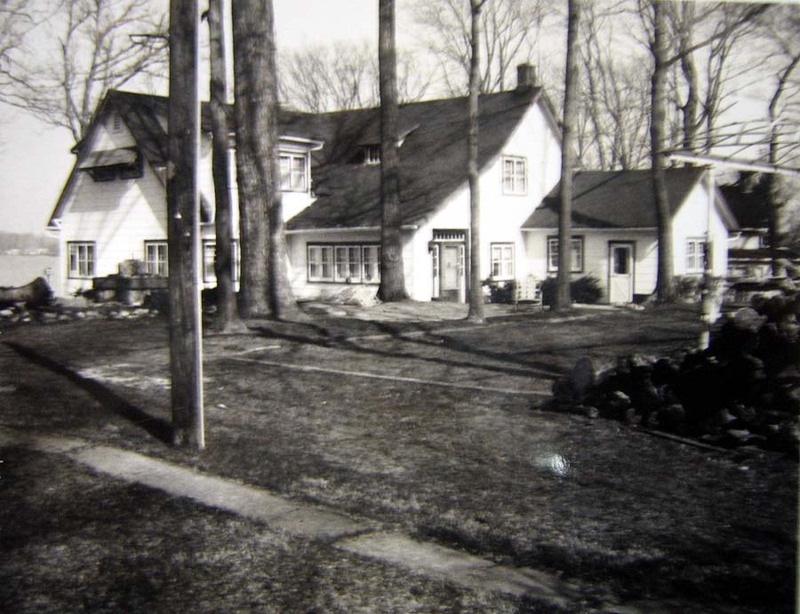 The House of a Thousand Candles still stands on the East Shore of Lake Maxinkuckee, and was in 1984 declared a Historic Structure by the County Historical Society (see article below). It is today owned by Professor Craighton Hippenhammer of Illinois, who has spoken about the house and its history on a few occasions in the recent past. 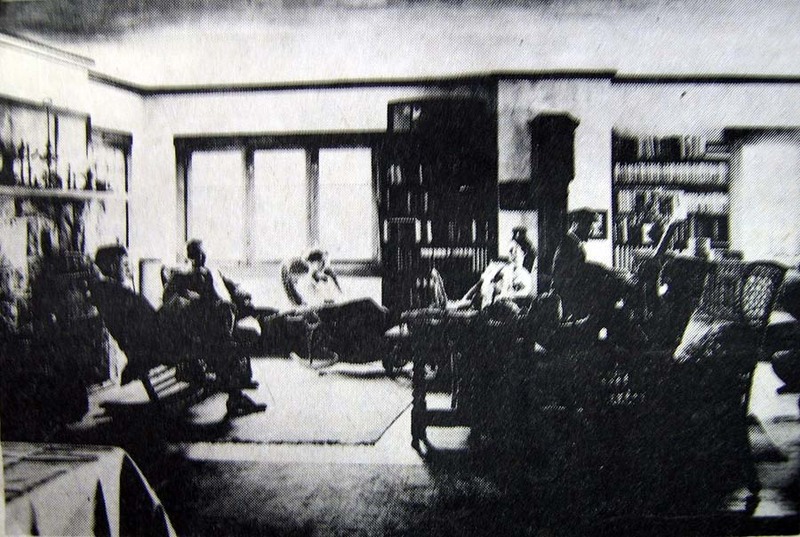 At left is an image of the interior of the house as it probably appeared around the time of the release of the book (1905 or thereabouts). 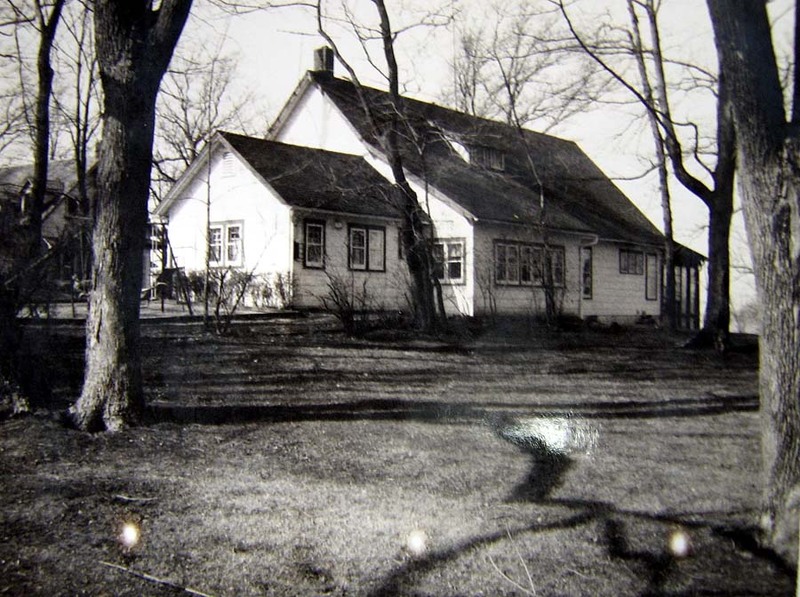 Below are some photos of the house as it looked at some point in the past 20 years, taken by a previous owned and made available through the Marshall County Historical Museum. Record of the Property Owners of the Land on which "The House of 1000 Candles" at 762 East Shore Drive, Culver, Indiana is located. The United States of America received title to all Indian Lands from Virginia by act of the General Assembly 12/20/1783 and by deed-signed by Thomas Jefferson, James Monroe and others 3/1/1784. Indiana occupied the land by treaties. Upon extinction of the treaties the land was surveyed from December 1833 to Sept­ember 1834. In his 1912 novel, A Hoosier Chronicle, Meredith Nicholson included a charming chapter on his main character Sylvia's first visit to Lake Waupegan, a fictional name for Lake Maxinkuckee. An excerpt is below. ...So it happened that on a June evening they left the train at Waupegan and crossed the platform to the wheezy little steamer which was waiting just as the timetable had predicted; and soon they were embarked and crossing the lake, which seemed to Sylvia a vast ocean. Twilight was enfolding the world, and all manner of fairy lights began to twinkle at the far edges of the water and on the dark heights above the lake. Overhead the stars were slipping into their wonted places. "You can get an idea of how it is at sea," said her grandfather, smiling at her long upward gaze. "Only you can hardly feel the wonder of it all here, or the great loneliness of the ocean at night." It was, however, wonder enough, for a girl who had previously looked upon no more impressive waters than those of Fall Creek, Sugar Creek, and White River. The steamer, with much sputtering and churning and not without excessive trepidation on the part of the captain and his lone deck hand, stopped at many frail docks below the cottages that hung on the bluff above. Every cottager maintained his own light or combination of lights to facilitate identification by approaching visitors. They passed a number of sailboats lazily idling in the light wind, and several small power boats shot past with engines beating furiously upon the still waters. "The Bassetts' dock is the green light; the red, white, and blue is Mrs. Owen's," explained the captain. "We ain't stoppin' at Bassett's to-night." These lights marked the farthest bounds of Lake Waupegan, and were the last points touched by the boat. Sylvia watched the green light with interest as they passed. She had thought of Marian often since their meeting at Mrs. Owen's. She would doubtless see more of her now: the green light and the red, white and blue were very close together. Mrs. Owen called to them cheerily from the dock, and waved a lantern in welcome. She began talking to her guests before they disembarked. "Glad to see you, Andrew. You must be mighty hungry, Sylvia. Don't smash my dock to pieces, Captain; it's only wood." Historical Society Presents Award to "House of a Thousand Candles"
The Marshall County Historical Society presented an award this week commemorating an important historical site on Lake Maxinkuckee. "The House of a Thousand Candles," located at 762 East Shore Drive, Culver, is presently owned by Mr. and Mrs. Harold (Dale) Long. The house was built in 1881 and is one of five built by the Vonnegut families at about that time. Two additions to the house were made since that time. The first was the addition of a living room area, and the second was a dining room. The dining room addition was added while the house was owned by the Wolfe family, and the person who ordered the work to be done was Jane Culver. She is reported (though not verified) to have asked that the dining room be "the largest on Lake Maxinkuckee," and (it) probably was for many years. The House is named after the book, "The House of a Thousand Candles," which was written by Merideth Nicholson in 1905. Mr. Nicholson was a friend of the Vonnegut family and it is believed that the book was written while Nicholson stayed at the house during the winter of 1904-05. The book is a novel, set in a place based on Lake Maxinkuckee. 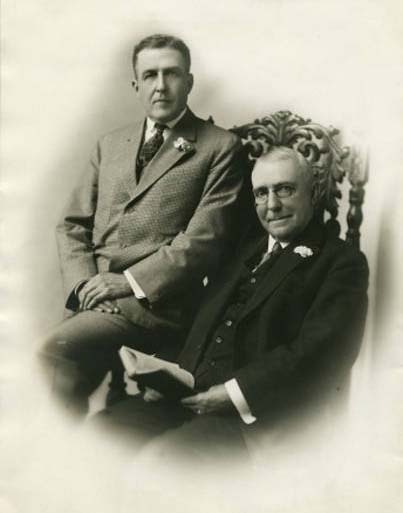 The Longs purchased the house from Charles Evans Hughes, the nephew of the former Supreme Court Justice by the same name, in 1971. They considered tearing down the building at that time and starting over, because the house had been empty for several years and was in severe disrepair. In the end, they decided to repair the home, and remodeled the house along the original plan and the house looks much the same today as it did 75 years ago. The only major changes to the structure are a modern kitchen and a new back porch, which offers a breathtaking view of Lake Maxinkuckee. The copper kettle at the right in the above picture was used by the Vonneguts in the making of apple butter. 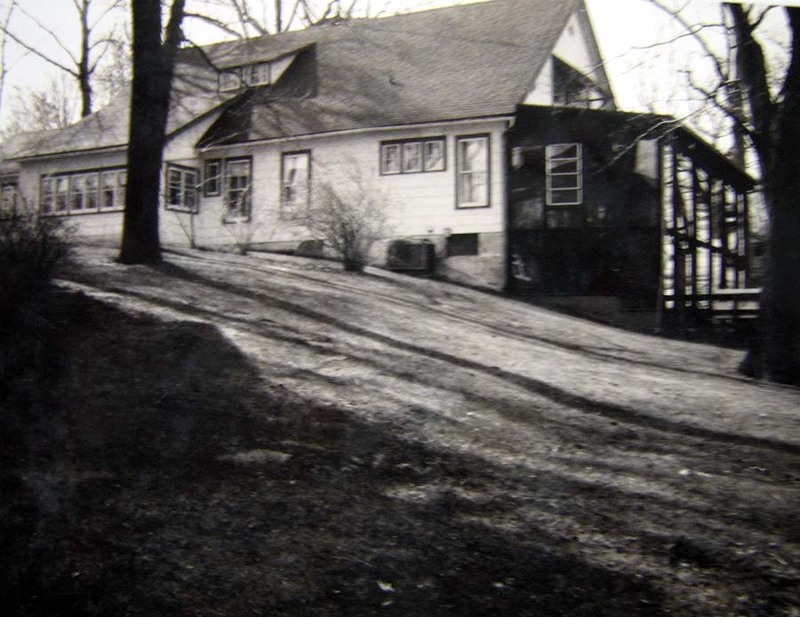 The owned a large orchard in the east shore and held an "Apple Festival" at the end of each season, complete with a band, which performed on the deck which still overlooks the lake next door to the Long's home.